Saturday we were at the beautiful Sandridgebury Farm for Georgia & Andrew’s Wedfest! 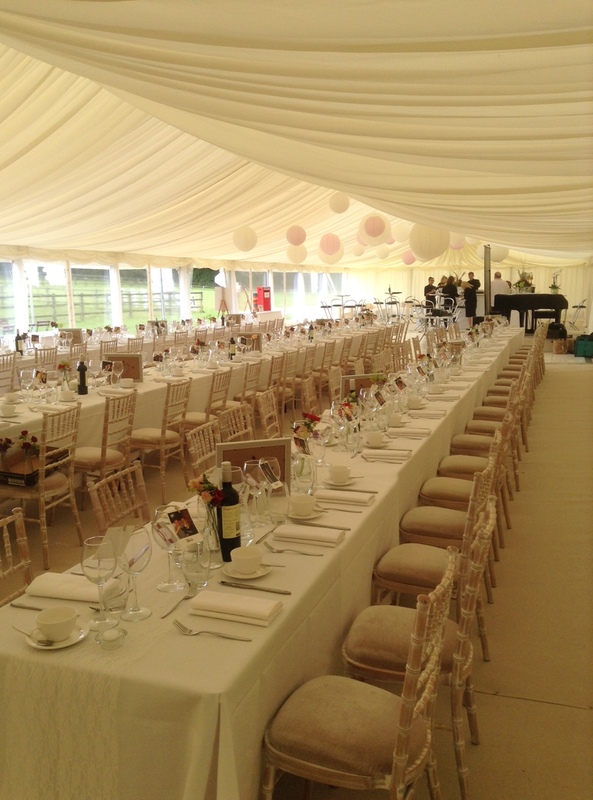 The marquee was set out with long bench tables, a huge central bar and flags and bunting outside. Place names were marked with a polaroid picture of each guest with Georgia or Andrew, lovely touch. 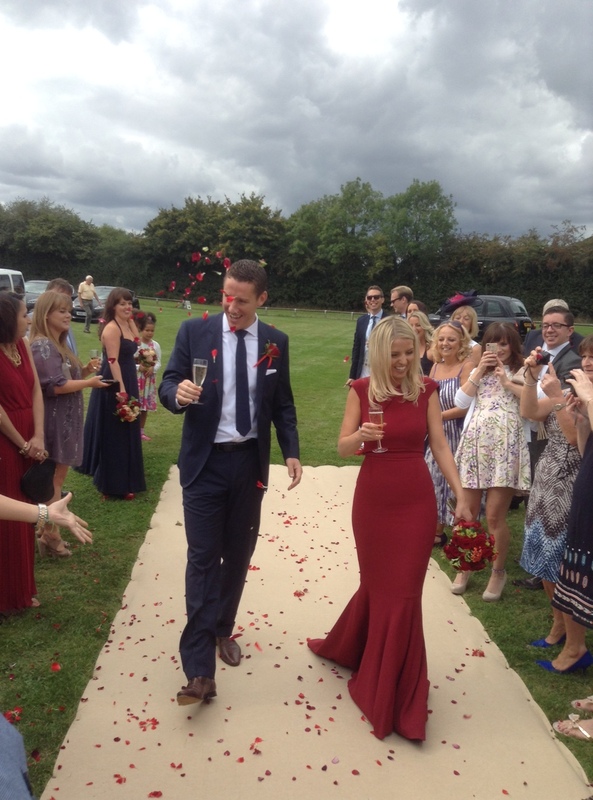 The guests arrived to Champagne and Pimms and were greeted by their guests throwing red rose petals over them as they walked down the carpet to the marquee. Red was the theme with Georgia looking a stunning bride in a beautiful red dress. Rather than canapes they had mini burgers in boxes; cheeseburgers, pulled pork & redslaw and cajan chicken with guacamole, Yum! 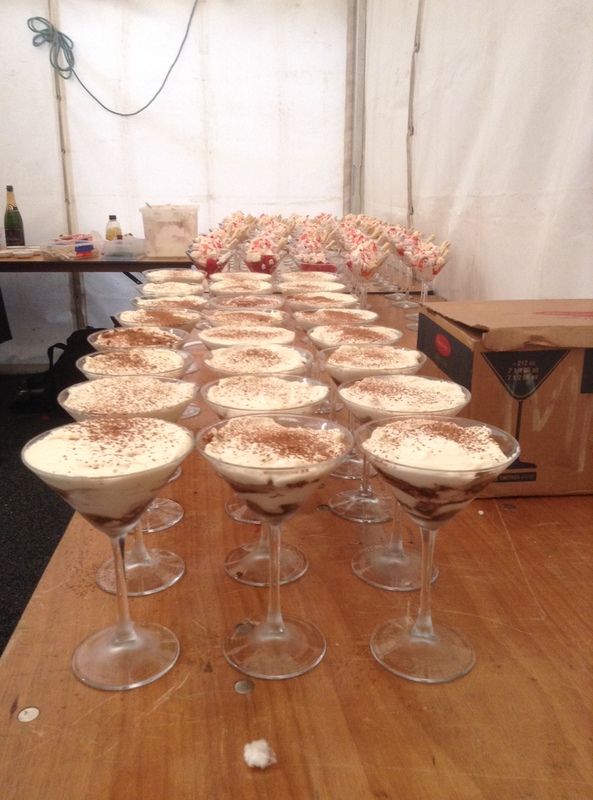 These went down very well with the guests. The wedding breakfast followed with Roasted Sirloin of Beef served whole on a carving board for the guests to share. We put chefs hats on nominated guests to be the carvers. This was hilarious as some took it very seriously sharpening their knives beforehand and carving the perfect slices! Some did end up like doorsteps though! We served this with sides of hand cooked chips, homemade coleslaw, rocket, parmesan and pine nut salad and a vine tomato, boccocini, red onion and rocket pesto salad. For dessert they had asked all their guests to bring a dessert, this Georgia and Andrew served to them with a little help from KF staff! The bar opened, the band played and they danced the night away. A great day had by all. I must mention our very hard working staff, most of them will leave for uni soon, we will miss them, they have worked so hard over the summer for us, we hope to see you all back at Christmas and next summer! Thanks guys! 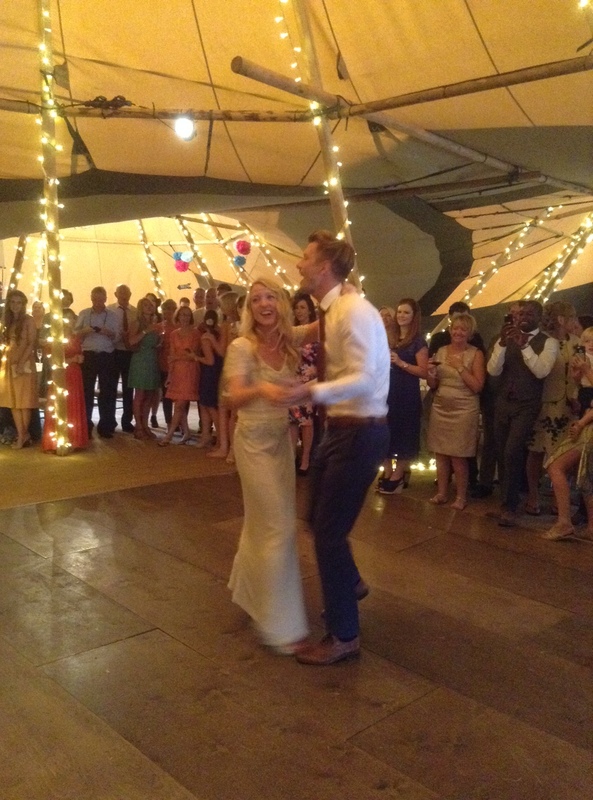 Our lovely couples on Saturday! Rain and storms Friday dampened the set ups and today washed out the clear up, but Saturday the sun shone all day with not a spot of rain! Someone was watching over them, they were all so delightful that they deserved the perfect day! MJ & I went to Sandridgebury Farm for Kathryn & Chris’s reception. 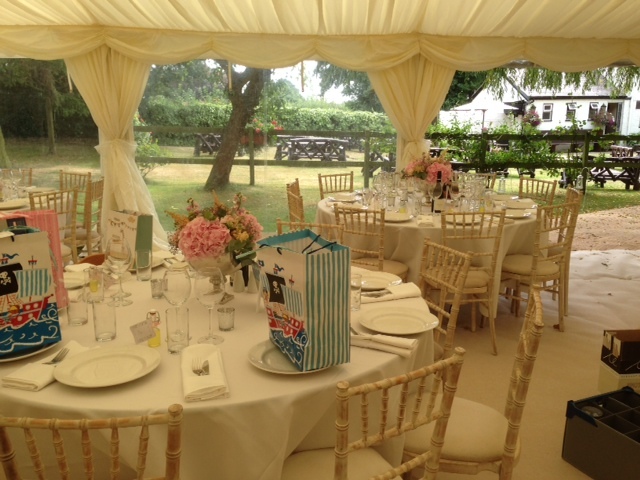 The marquee looked stunning with so many flower arrangements that her Mum and friend had made, with potted herbs as favours it looked and smelt fantastic! They arrived to chilled glasses of Prosecco and afternoon tea canapés shortly followed by their Lady Toast Master, Joyce Goodwin expertly setting up their receiving line, she politely told them that everyone will want to stand and chat for ages, but we have a feast to eat! So shake hands and pass them along the line, like passing a rugby ball! Couldn’t of said it better myself! Delightful lady, was a pleasure to work alongside her. 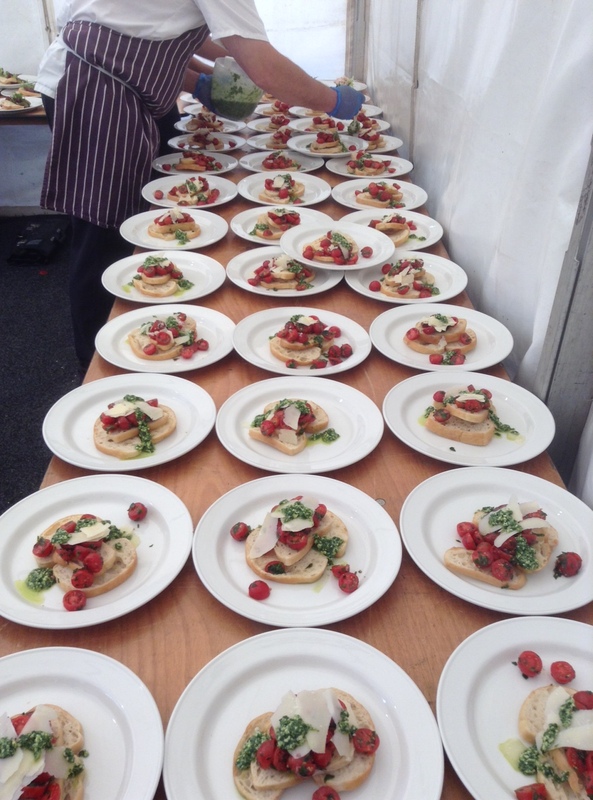 They had a traditional three course wedding breakfast with a choice of Chicken Liver Pate, Spiced Red Onion Chutney, Cornichons, Ciabatta, Rocket Leaves or Bruschetta of Cherry Vine Tomatoes, Garlic, Olive Oil, Shaved Parmesan, Rocket Pesto, that was just for starters! Then for main course they had a hog roast, complete with stuffing and crackling accompanied by buttered baby new potatoes and salads of Rocket, Mixed Baby Leaves, Parmesan Shavings, Lime Dressing; Roasted Med Vegetables, Garlic, Lemon and Olive Oil; and Vine Tomato, Feta, Cucumber Black Olives and Rocket Pesto. 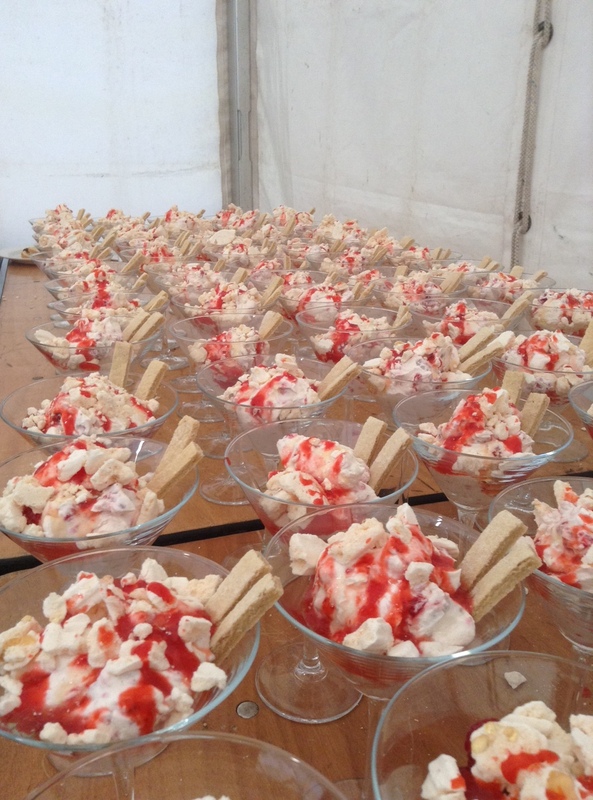 But MJ did save the best till last a choice of Eton Mess or Tiramisu, even all the staff’s mouths were drawling! It looked divine and not a bit was left by anyone! Dancing followed and a very happy couple started with a dance they had obviously been practising! Very sweet. Evening food of cheeseboards and wedding cake completed the feast! Joyce was right to get them in and moving so quickly! Lovely family, we all enjoyed being part of such a special occasion. Dan & Ian were at Haileybury School for Lisa & Andy’s reception. Andy went to school here, so it seemed fitting to hold the ceremony there. 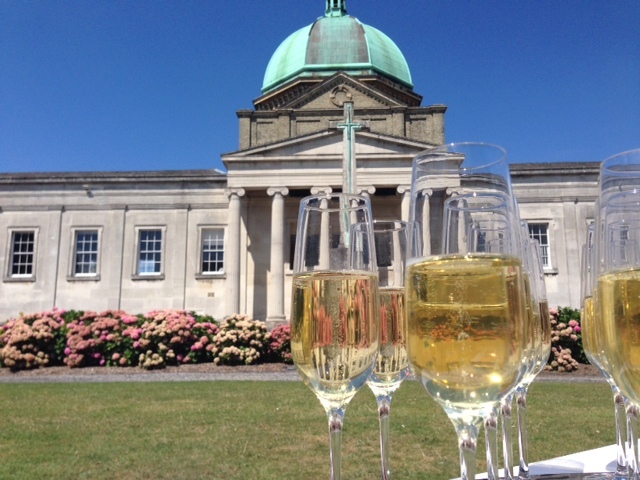 After getting married in the schools chapel the bride and groom came down a red carpet with their friends and family to be greeted by chilled champagne and Kingfisher canapés in front of the marquee. 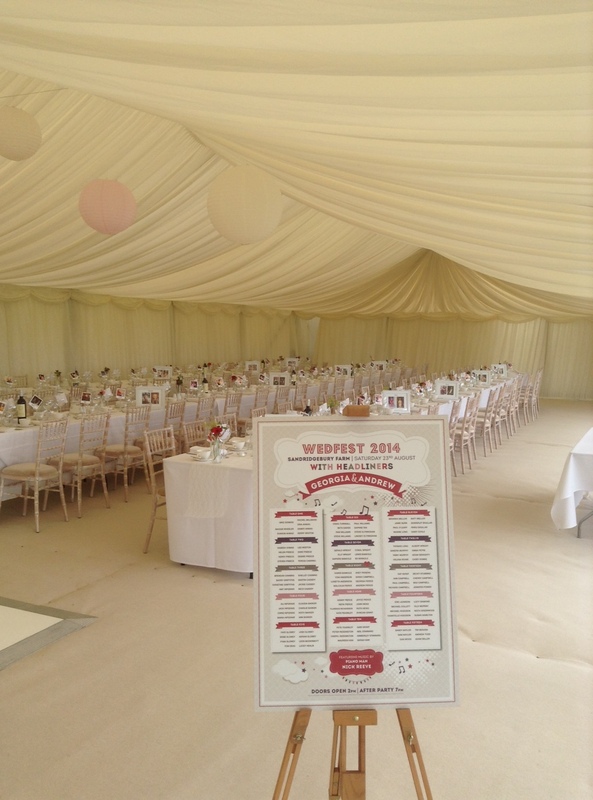 The marquee sides were pulled back for the start of speeches to allow the sunshine to flood in. Another 3 course wedding breakfast was served with a choice once again over the courses. Busy prep week for the kitchen! Well done team and with JV sunning himself it can’t of been a easy week! They started with Roasted Butternut, Rocket, Sun Blushed Tomato and Devon Blue Cheese Tart, Roasted Pepper Tapenade, Herb Salad or Poached Salmon and Tiger Prawn Tian, Lemon and Parsley Mayonnaise, Bloody Mary Dressing or Ham Hock and Parsley Terrine, Walnut Bread ,Spiced Apple Chutney, Pea Shoots. 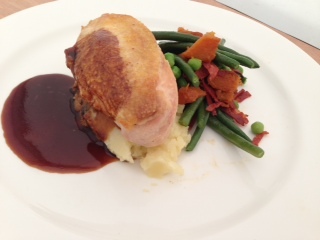 Followed by a main course of either Roasted Breast of Corn Fed Chicken, Champ Potato, Warm Salad of Chorizo, Green Beans, Peas and Butternut, Madeira Jus or Rump of English Lamb, coleannon mash, asparagus and baby carrots and mint hollandaise or Black Olive Polenta, Roasted Vegetables and Mizuna Pesto. 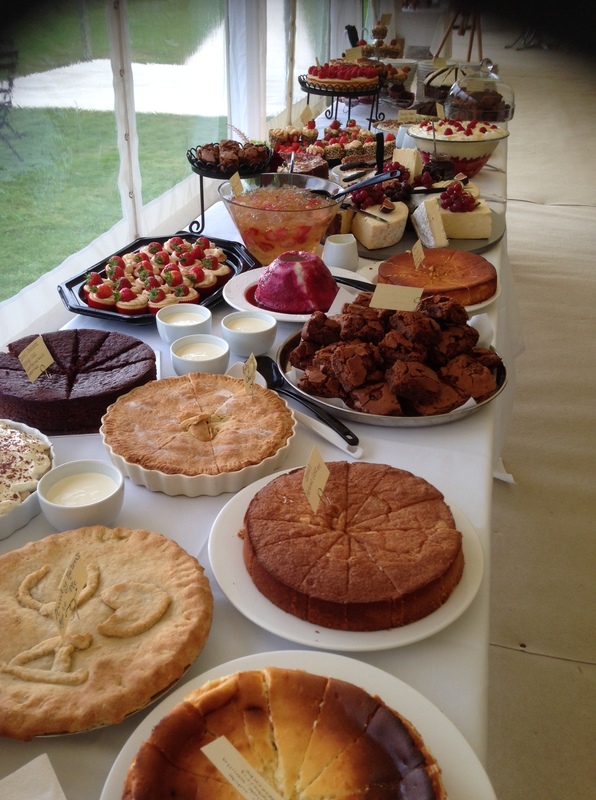 Lastly another Trio of Desserts of Pimms, Mint & Strawberry Trifle, Sticky Toffee Pudding, Salted Toffee Sauce, Clotted Cream & Lemon Posset, Raspberries, Ginger Biscuit! Delicious! 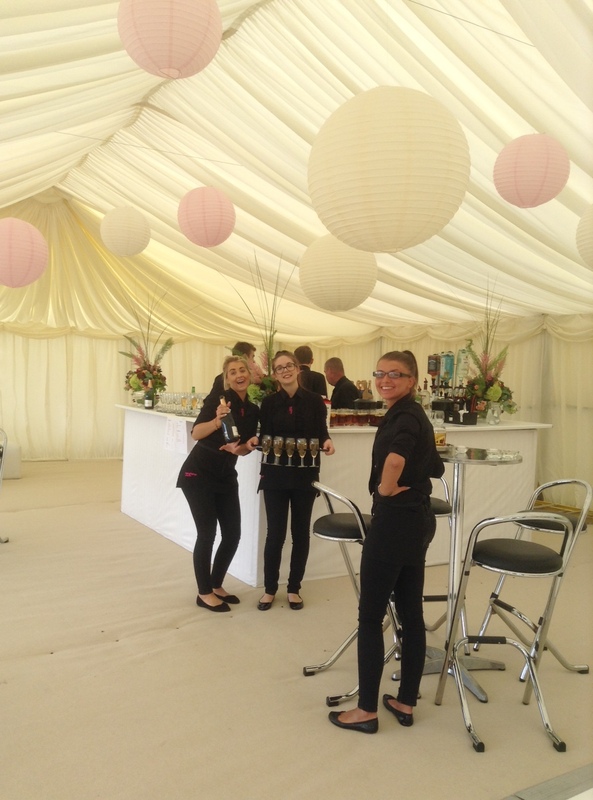 With the bar open and the sun cascading into the marquee, it was only a matter of time before everyone was dancing the night away to an amazing DJ. With carriages arranged for midnight, the bride and groom and many friends and family made their way to their local hotels to continue their celebrations into the small hours! So well done to all Kingfisher staff again! a huge effort this week by everyone involved! Here’s onto next week! Cheers! August 2nd already! This season is flying past with us adding more and more great celebrations and weddings to our ever increasing portfolio! Saturday was again a day never to be forgotten. 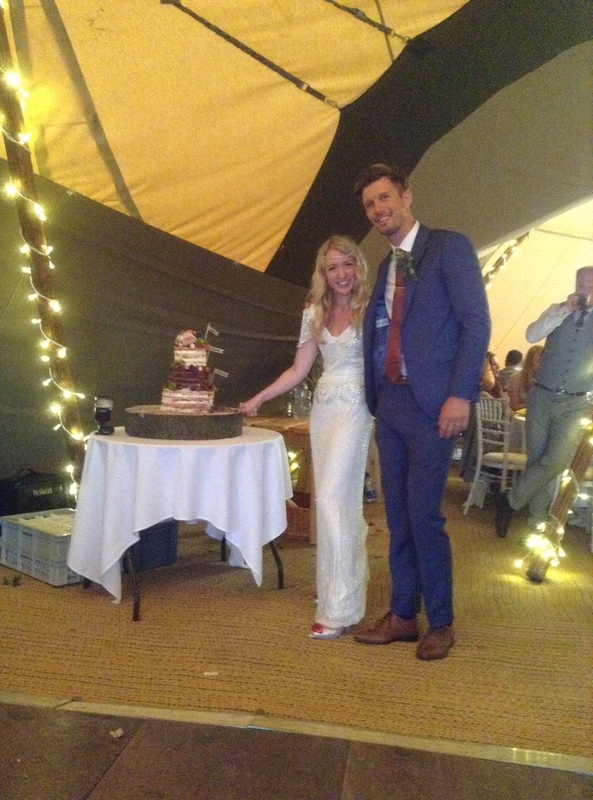 My team and I made our way to the beautiful Lavender Farm nr Hitchin for Lucy & Kevin’s wedding, a lovely family who we have met on numerous occasions over the past few years, in fact we fist met them at Lavender Farm when we had an open day with Tipis for hire! The Lavender was in full bloom giving a stunning purple backdrop across the fields, it made the site seem so romantic and special. 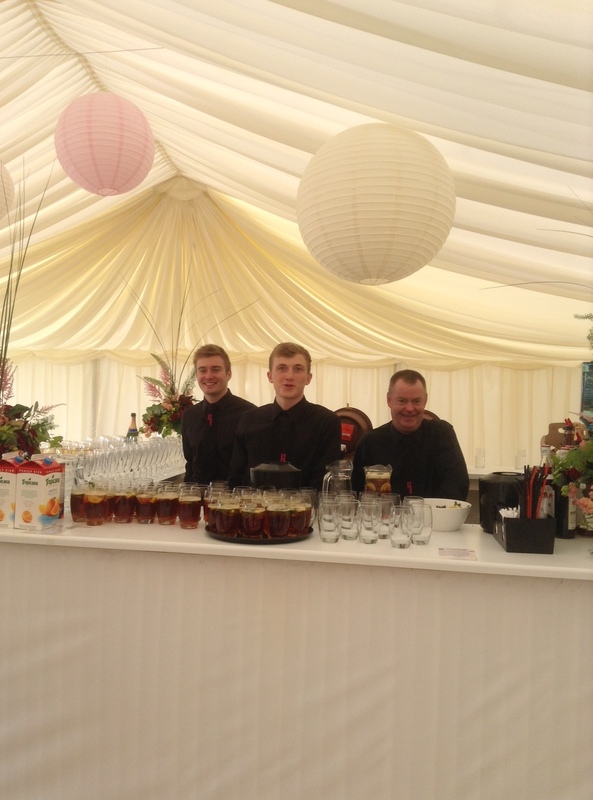 Lucy & Kevin arrived with their son Jack to their guests toasting them with Pimms, they were a lively crowd keeping our bar staff busy even before the meal! 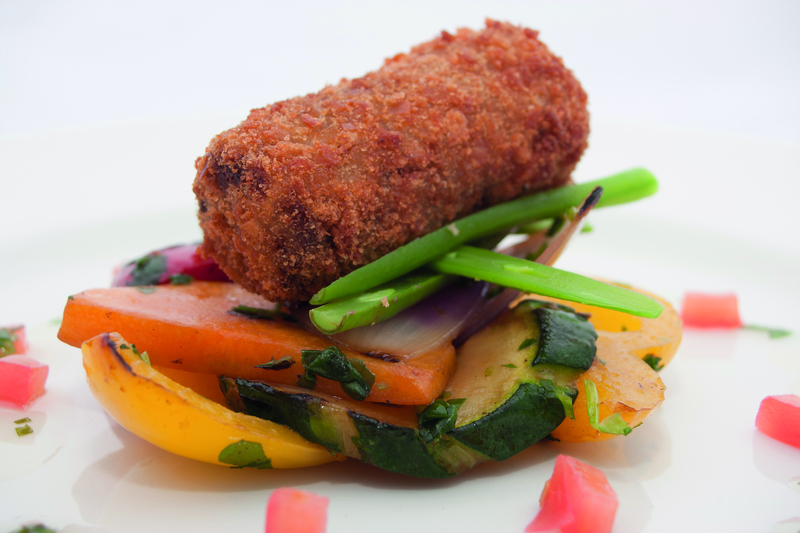 They feasted on a starter of Confit Lamb Shoulder Croquette, warm vegetable salad & mint dressing. Followed by our signature Kingfisher BBQ consisting of Beef & Stilton Burger, Summer Herb & Lemon Chicken Skewers, Peppered Rib Eye Steaks and Salmon, Monkfish & Prawn Skewer; all served with bowls & salads, cooked to perfection by John and MJ. 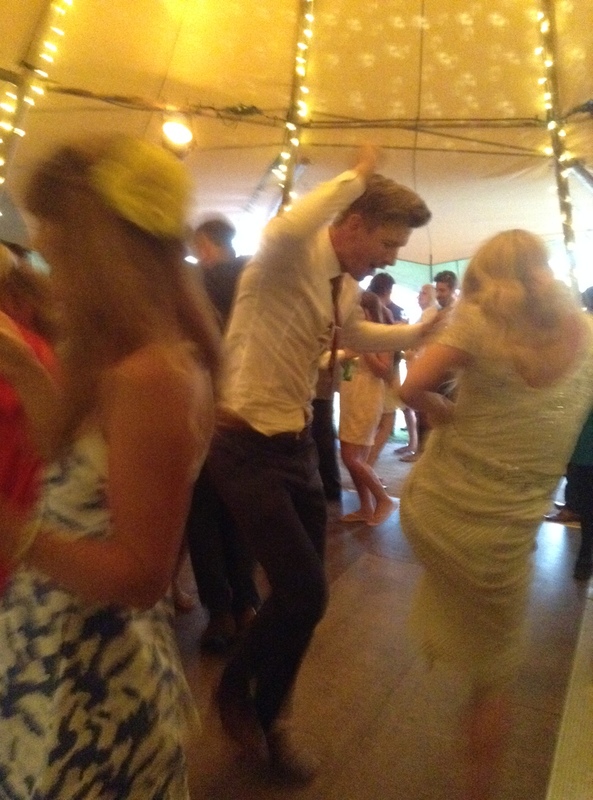 Lucy & Kevin partied hard, so did all of their guests, the bar was 3 deep most of the evening, even I danced with Dad! 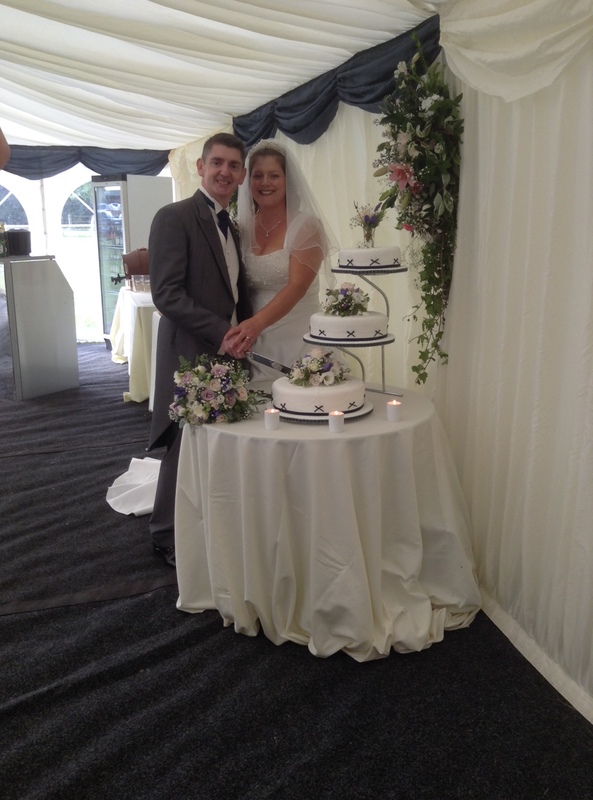 Great day had by all, so pleased for us to be part of such a special couples day! Team 2 with the lovely Ian, were back at the Holly Bush In St Albans for Laura & James’s wedding. 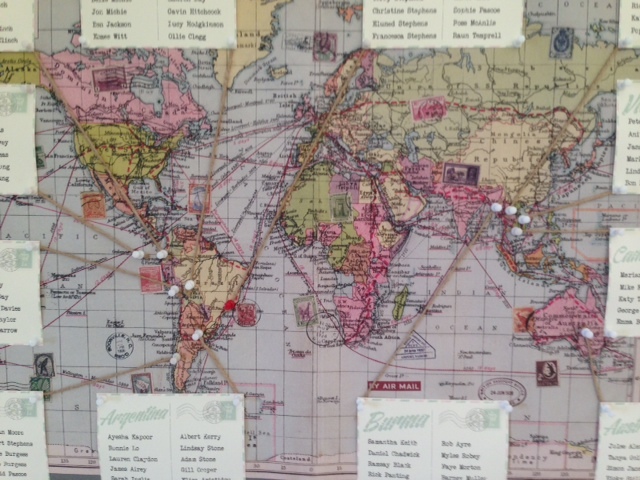 The couple had been traveling for 6 months to exotic places like Cambodia, Australia, The Galápagos Islands and Brazil. 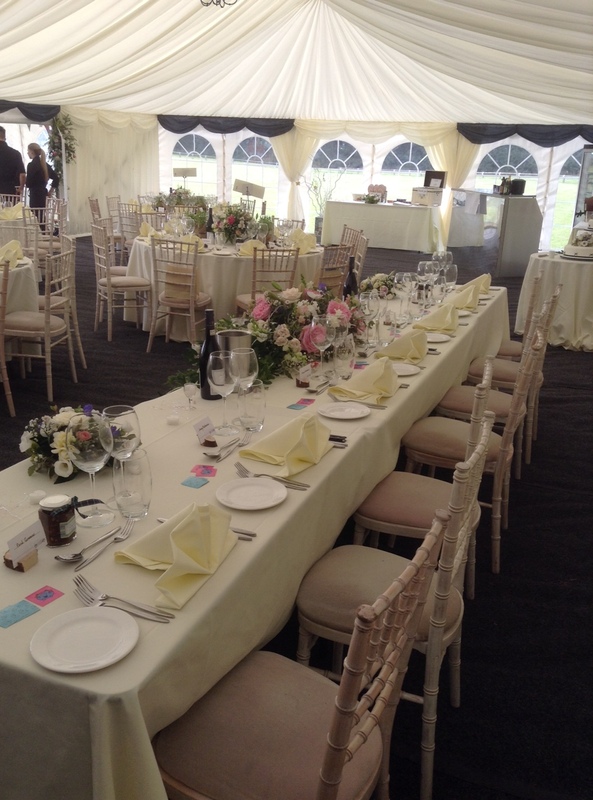 They used these very personnel places to aptly name their tables in the marquee. Everyone looked stunning, the bride was complimented by a stunning array of bridesmaids dressed in soft green long flowing dresses. 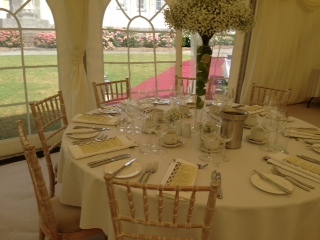 Canapés, Prosseco and freshly made jugs of Pimms greeted the wedding guests on arrival. from the lovely Vanessa & Steve. Although a brief down pour whilst the BBQ was being cooked it didn’t dampen proceedings, just the chefs got slighty wet! As always, it was a massive hit with all guests. Jeager bombs and drinks a plenty were flowering from the pubs doors, allowing guests to relax in the evening sunshine, another great day had by everyone.